Reviews | Data Graphics Inc. 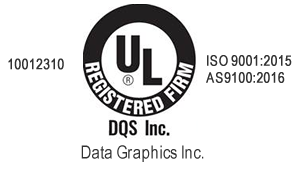 Reviews | Data Graphics Inc.
We could tell you all about our great service, but we’d rather let our customers do it with our industrial printing reviews. Browse the testimonials below to see why companies love working with us to fill their label, barcode, decal and overlay printing needs. by Frank Reed - CEO on Data Graphics Inc. I wanted to let you know just how pleased I am with the labels you manufactured for my company. They are outstanding and that is saying something coming from me as everyone I deal with thinks I am a perfectionist. From our initial phone conversation and your willingness to assist me with product samples through the entire process I could not be more impressed. Feel free to use me as a reference as I would be more than happy to provide an excellent referral for you and Data Graphics, Inc.
by Karen - Purchasing Mgr on Data Graphics Inc.
I’ve recently made the statement that we have been able to completely drop our previous supplier and will now be depending on Data Graphics for a majority of our nameplates. The consistent response has been “Oh thank goodness”. We have just received a 2017 Award for Excellence (7th consecutive year) and we were nominated for 2016 Supplier of the Year (2nd consecutive year). Data Graphics is well aware that this recognition does not come easily. We needs suppliers like Data Graphics and their team in order to maintain those high standards. Keep up the excellent work and please share with your team a heart felt, THANK YOU. by Supply Chain Mgr on Data Graphics Inc.
Once again I came to your company to get me a special ID plate that my customer needed in a very short time, and once again you and your company rose to the occasion and delivered what I needed in record time. We have only been doing business for a very short time but the end results have been WOW. (Best I can describe it). As a Supply Chain Mgr. it is very difficult to find a company like yours, especially in my back yard that continues to impress me with your product and turnaround times when I need something is a very big hurry. As I have said before your company is one of a kind and I really appreciate the work your entire company does to get your customers product . Again thank you. by Anonymous on Data Graphics Inc.
Two things I have learned over the years…. 1) Not enough people take pride in their job nor are most willing to go above and beyond, Data Graphics does both. Synapse is very fortunate to have a supplier as flexible and willing to work with us as Data Graphics demonstrates on a regular basis. "I just wanted to send a quick thank you to you and your team. The labels I ordered from you came out perfect and look fantastic. I can't thank you enough for all of your help. You were fantastic to work with and the quality of the product is off the charts! I very much look forward to having an opportunity to work with you again. Thank you so much for treating my small order with all the importance of something much larger. Your professionalism and attention to detail was very much appreciated and I will, of course, highly recommend you to anyone I know in need of any services that Data Graphics offers. Again, I can't thank you enough." “WONDERFUL! Thank you and your team for your turn around and support…It is much appreciated"